The village of Ingleton is surrounded by magnificent countryside with caves, waterfalls, and mountains. The Craven Fault crosses the area, and geological and archaeological sites abound. 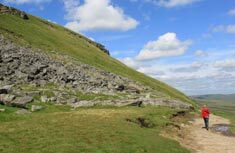 The area is famous for the Three Peak Challenge Walk of Pen y Ghent, Whernside and Ingleborough as well as fabulous limestone scenery. There is much to see and do from Ingleton from the dramatic underground scenery of White Scar and Ingleborough Caves to the Ingleton Waterfall Trail and Malham Cove. Climb the Inglesport climbing wall, swim in Ingleton's open air swimming pool, bird watch at RSPB Leighton Moss or enjoy the views from the Settle-Carlisle Railway. Ingleton has a wide range of holiday accommodation, and is well placed for visiting the Yorkshire Dales and the Lake District. 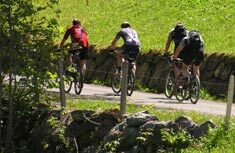 Choose from hotels and guest houses, bed and breakfasts, self-catering cottages, bunk barns, caravan sites and youth hostels.